Can I have cosmetic eyelid surgery after LASIK surgery? Very often, yes. However, if the LASIK surgery has resulted in symptoms of dry, itchy, or watery eyes, you will need to proceed very carefully to be sure that these symptoms do not get worse. The first step is to have Dr. Fata do a test to determine if you are producing enough tears. If this test is normal, your cosmetic eyelid surgery (blepharoplasty) can be considered. But it should be limited to a conservative amount of skin removal and should incorporate a procedure called canthopexy that increases support of your lower eyelid. This will protect your cornea, the transparent shield that covers the eye. If these precautions are taken, you may be a candidate for cosmetic eyelid surgery with low risk. Do I need a brow lift or upper eyelid surgery for my droopy eyelids? As you reach middle age, you may notice an extra fold of skin over your upper eyelids. This can occur either because the eyelid skin has become loose and stretched out or because the eyebrows have sagged. If your eyebrows are in proper position, then you are a candidate for eyelid surgery alone, but if sagging eyebrows are a large part of your problem, then you may need a brow lift. In women, the desired eyebrow is a gentle arc that curves above the edge of the eye socket along the outer part of the eye. In men, the eyebrow shape is more flat but still should not lie below the edge of the eye socket. To help identify what you may need, try this test: close your eyes, relax, and gently place your fingertips against your eyebrows. This is their natural position at rest. Then slowly open your eyes to assess the position of your eyebrows. If as you release your fingers your eyebrows begin to elevate, your forehead muscles are reflexively raising the brow to correct the sagging. Another telltale sign that you may need a brow lift are deep horizontal furrows in your forehead. What are the risks of cosmetic eyelid surgery? There have been reported cases of double vision or even loss of vision but fortunately these cases are extremely rare. 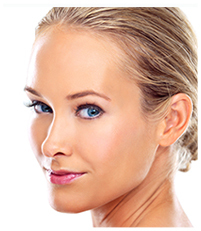 Overall, blepharoplasty can be performed very safely with a low risk of a complication. The eye is naturally supported by a cushion of fat behind the lower eyelid, which is held in position by a sheet of tissue in the lower eyelid known as the orbital septum. As we age, this septum becomes weaker and stretches, allowing the fat behind it to bulge into the lower eyelids. Although it may appear as though you have excess skin, conservative removal of the bulging portion of fat in a blepharoplasty may be all that you need and the skin will re-drape over this more youthful contour. Will I have visible scars after cosmetic eyelid surgery (blepharoplasty)? The visibility of a scar in any surgery depends on several factors, but two of the most important ones are (a) the location of the scar and (b) the type of skin. Fortunately, the eyelid skin is thin and forgiving and typically yields fine, hairline scars that are barely visible. In the upper eyelid, the scar is placed in the eyelid crease, which is not visible when your eyes are open. In the lower eyelid, often I will remove only fat, allowing the scar to be placed inside the eyelid where it cannot be seen. Don't feel that you must live with droopy eyelids, puffy eyes, or wrinkles around your eyes. 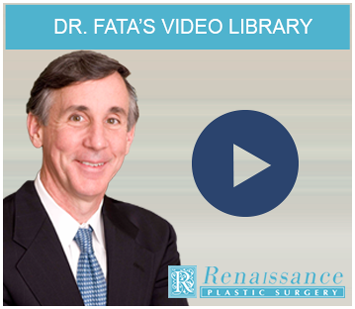 Dr. Fata can correct these signs of aging to give you a fresher, more alert look with cosmetic eyelid surgery. Please call Renaissance Plastic Surgery or call 317-575-9152 today for a consultation.